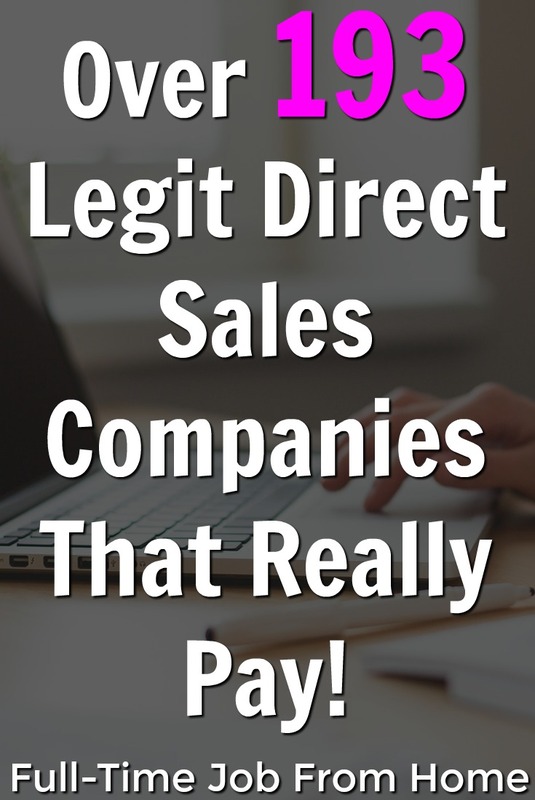 If you’re looking for legitimate direct sales companies, you’re in the right place. We’ve put together a list of over 193! I have tried more than a handful of these direct sales companies, so I thought this would be an “easy” post. Ha!! I have spent COUNTLESS HOURS trying to find ALL of them. And while I have almost 200 companies on the list, I’m sure I’m still missing some. The DSA.org (Direct Selling Association) has a directory of 130 direct sales companies who are registered with them. My list is a combination of the DSA’s list, and other companies I found through Facebook Groups. If you have questions about specific companies, I recommend that before you ask Brok and myself, please reach out to the person who shared their information with me because they will want to help you! Or go to the website for the specific company and see if you can call or email them directly. If you want my opinion about companies, I’m happy to try to help, just leave comments below this post! In this post, I am focusing on cost to join, cost to maintain, and commissions. In general, it seems as though many of them are right at the $99 price point to join, around $10/month to maintain, and around 25% commission. Direct Sales won’t be for everyone, make sure to check out My #1 Recommendation, it’s how I made over $13,000 online last month! I will also answer some frequently asked questions. And I’ll tell you what you should consider when choosing a company. Enjoy! Direct sales is the selling of a product or service in a non-retail environment. Direct sales is traditionally a party plan model where you go into someone’s home to demonstrate your product or service, and take orders. This has changed a lot because of the internet and social media. Now you don’t have to have parties. In the past, before the internet was widely used, they had “catalog” parties. This is still done but has transitioned into a third party option or “Facebook” parties. Based on that, most of the companies I am going to talk about are MLM’s, even though they refer to themselves as Direct Sales! Bottom line, if you can pay to join the company, rather than being hired, and you are the boss (ie, independent contractor or representative) then these are the companies we’re talking about. How Do I know if a Direct Sales Company is a Pyramid Scheme? Some legitimate direct sales companies look like they are arranged in a pyramid fashion. Meaning, they are trying to enroll 2 people in order to “unlock” more earning potential. This doesn’t mean the company is a scam. This is a really great article from the Direct Sales Association that explains how to know the difference. And they give you time to make a decision – any good opportunity will still be there tomorrow! What Kind of Direct Sales Companies are Available? The largest category, by far, is health and wellness. A lot of the categories overlap. For example, Isagenix (59) is a health and wellness company which also has skin care. Isagenix actually just came out with a line of essential oils as well. Young Living (190), who is well known for essential oils, also has skincare and protein shakes, as well as a new cosmetic line. While many companies overlap in categories, they are usually more well known in one particular niche. So I narrowed my list down to what I think is their primary product line. What do Direct Sales Companies Sell? Can you skip or pause the auto shipment? Can it be modified or canceled at any time? The cost to enroll is a one-time expense you will incur to start your business. The cost to start can range from free to hundreds or even thousands. But the most common price seems to be $99. With your cost to enroll, you will usually get some supplies to help you get started; order forms, catalogs, or brochures, as well as sample products that you can use or sell. In my list, the more expensive enrollments cost more because you’re purchasing a large amount of product to carry as inventory. The cost to maintain refers to the monthly or yearly fees required to sell the product or service. The fee is usually tied to the cost to have the replicated website so that people can place orders through your website. The company might also send emails on your behalf. If you’re lucky, you will have a website with no fees. But it’s common to pay $10-$15 per month. Is Inventory Required for Direct Sales Companies? Most direct sales companies don’t require inventory. But some do. You want to be careful with these – joining a company that requires you to sell from your own inventory is a much bigger commitment. If you want to try something but you’re not 100% sure about it, DON’T join a company that requires that you buy inventory to sell. If you change your mind a couple months into it, you’ll be out a lot of money and possibly sitting on a bunch of product that you no longer have the desire to sell. Inventory isn’t bad, don’t get me wrong! But you need to be really sure that you’re ready to sell it! How Do You Earn Money with Direct Sales Companies? Most DS companies offer a commission for sales. Commissions range from 10% up to 85%. Most common is 25%. I feel pretty confident saying that all companies on the list offer more compensation than what’s shown on my list. I am showing you the percent commission that you start with when you first start your business. Thirty-One (170) for example, everyone starts making 25% on their sales. But when you’re promoted to director with Thirty-One, you will earn an additional 10% on your own sales, plus a percent of your team sales. This is true for most of the companies on this list. Most companies will have higher commissions as you grow with the company. Sometimes the commission is based on the amount you purchase, so if you make a large initial purchase, you could start off with a higher commission. Several companies also offer other ways to make money, such as residual sales on reorders. Growing a team is usually the way to earn a lot more with any direct sales company. When you sponsor people to join your team, and you help them succeed, you typically earn a percentage of their sales as well. Some companies have signing bonuses, meaning that when someone joins your team as a business builder, you immediately receive a bonus. There are many other ways to earn money, and you have to look closely at the compensation plan for each company for the details. Do You Have to Like What You’re Selling? Absolutely! One of the most important things about choosing a direct sales company is that you like the product. Do you enjoy talking about your product or service? Are you talking about it because you’re pushing it or are you talking about it because you thoroughly believe in it? Do you love it or are you embarrassed to tell people that you’re selling it or using it? If you’re embarrassed about it, you won’t be able to sell it. But if you’re proud of what you’re using or what you’re doing, or you have amazing results, it will be much easier to sell it. Consistency is important to be successful in sales, so it’s important that you enjoy it. That will make it much easier to stick with it and ultimately, to be successful. Do Direct Sales Companies Have Quotas? A quota is the amount of sales you need in order to stay active, remain a sales representative, or to get paid commissions. You almost always have to meet a quota to remain active. And you most likely need to be active to get paid. Some companies require much less to be active. Quota is commonly in terms of volume sold in a rolling 3 or 6 month period. Some companies will require you to have a certain PV (personal volume) that you order for yourself, or an auto-ship, to qualify to make money on certain transactions. This is something you see mostly in the health and wellness companies. 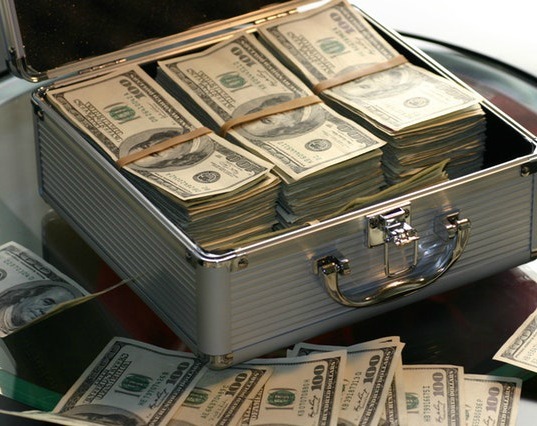 How Do Direct Sales Companies Pay? This varies. Some companies pay weekly, while others pay twice a month, or even once a month. Many also have a minimum payout amount. It’s not usually very high but could be $10 or $20, and if you haven’t earned enough for the minimum, it will roll over until you do have enough. Most will pay via direct deposit, live checks, or debit cards that get loaded with your payouts. Some newer companies pay through PayPal. Can You Be in Multiple Direct Sales Companies? Yes, you can. But how are you branding yourself? Are you the person that pushes every new product that comes along or do your product offerings make sense together? You’re probably not going to sell two different things that are conflicting, like 2 jewelry companies, but you might do jewelry and wine. Or maybe you’re branding yourself as a wellness expert, and you can combine a health & wellness company along with hemp oil. Ultimately, you can do anything you want, even if the businesses don’t make sense together. If it’s two completely different products, but you’re passionate about both of them, you might be able to do it. But the people who do really well in these companies will tell you that you can’t do both great. What that means is that if you give 100% of your focus to 1 company, you will do better than if you give 50% of your focus to 2 different companies. On the other hand, if you’re trying to figure out what it is that you like, there’s nothing wrong with doing more than one and then picking the business that really seems to work with you and your values, lifestyle, your family, and all the things that you have to consider. What are the Advantages of Direct Sales? Still can’t decide which company to join? Narrow it down to a category or type of product or service that makes sense for you. Then look at the category list and look at each company’s website. Does one catch your eye? If you have a friend who sells something and wants you to join her team, it will mean a lot to her, plus it will be good friend time while you talk about business. Join a company that you want to get the product at a discount. That is absolutely how I got started with Thirty-One (170). I was at a party, and I loved everything. I couldn’t decide what to get, so I got the starter kit for $99. I had sold things in the past, so I knew I might start selling it. I casually posted on my Facebook profile that I was giving this business a try and having an online party. I got enough orders to put it in as a party. I got the hostess rewards and the commission. That was it, I was hooked! This is all of the Direct Sales and MLM companies I found. I am listing them here in alphabetic order, including their website. Throughout this post, I have mentioned some and will continue to talk about them. When I mention a company, I will use the number that you see in this list to help further identify them. So if you see one you’re interested in, you can come back to this list and find it. 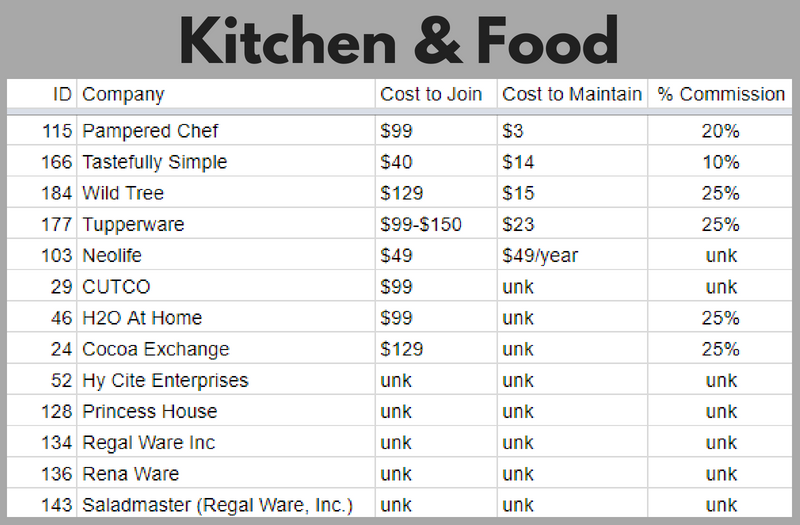 After the list, I will break them down into categories and compare their cost to join, cost to maintain, and commission. 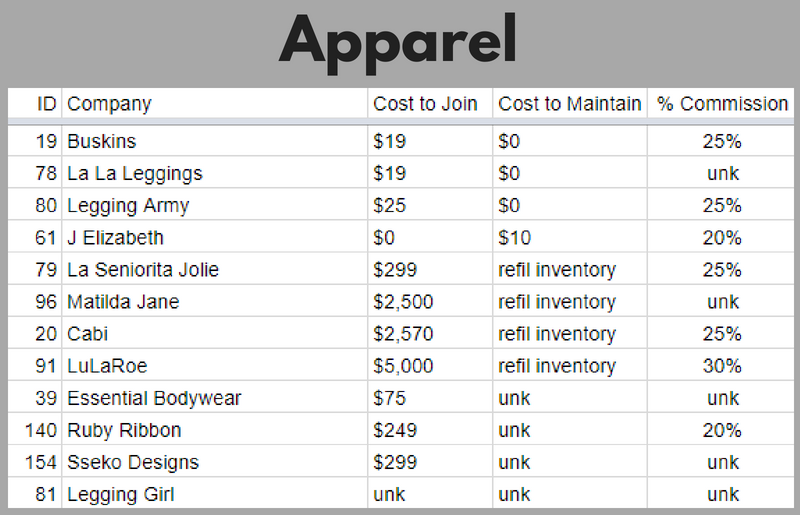 What we see here is the list of clothing and apparel companies. As I’ve said before, some of these would overlap into other categories, like jewelry, but predominantly these companies are clothing. If you love to shop for new clothes, you should look at this list! You’ll get a discount on your product, so pick out something that you like! I personally have a thing for leggings. I have bought more LuLaRoe (91) leggings than I want to admit! When that craze started, I said more than once that I would start selling it if we weren’t living in a tiny condo. You have to buy inventory and sell from your stock. They have a unique setup where they only produce a limited number of items from each print. So as a buyer, you’re afraid you’ll never see them again, and you don’t have long to think about it, so you buy them. Every time someone commented “sold,” all I saw was dollar signs for that consultant. Thanks to writing this post, I’ve found some other legging companies where I can buy from stock, which allows me time to think about if I really need them. What caught my attention on this list is Buskins (19) and LaLa Leggings (78). What’s really nice about these companies is that you pay nothing monthly to the company to maintain your business, and the cost to join is minimal. Both basically have you buy a minimum of 1 pair of leggings in order to get started. Be cautious of any of the companies that say “refill inventory.” These companies require you to carry inventory, and you will need to buy more stock as you sell it. That also makes it harder to stop selling it because you’ll likely end up with a lot of unwanted inventory which you’ll probably end up selling for a loss. Do any of these companies catch your eye? They all should! With average to very low start-up costs, average commissions, and no maintenance for 3 out of 4 companies – take your pick! Elk River Soap Company (35) caught my eye, at only $6 to join and nothing to maintain – can’t go wrong, right? Well, I actually joined by paying my $6 on 8/6/18, and it wasn’t until 8/20/18 that I was finally set up. The problem is that I joined under someone who went inactive and I had to wait to hear from someone else. But what I like so far is that it’s handmade in Minnesota, and when I placed an order, I received it 2 days later! Same with Sugar Shower (161), it’s a pretty low start-up cost, plus zero to maintain. If you like this category, you have some nice choices. Posh (124) has a larger product offering and more sophisticated look. But the commission is a bit lower. What I’ve noticed about the smaller and newer companies is that they usually don’t charge monthly to use their website, but they are not quite as sophisticated, and the joining process seems to be more difficult and drawn out. This is probably a good thing to note for all of the companies on this list. If there is a person that you can contact directly, before joining, you should. With probably all of the companies on this list, you’ll need to join “under” someone. And it will help you in the long run to have someone to go to with questions. This is a nice category. I sold Partylite (118) years ago and I really enjoyed it. Back then I don’t think there was a maintenance fee, and I even got free catalogs and supplies, but things do change. What I like about Partylite is the low start-up cost and average commissions. Something else I liked about PartyLite, and you could apply this to any company you choose – they wanted you to book 6 parties, right when you sign up. This is brilliant and quite necessary to launch your business. I highly recommend applying this strategy to any company you join. In this list, Jewelry Candles (68) is low start-up cost and no maintenance fee. It’s only 20% commission, but if you don’t have a lot to get started and you enjoy candles, this might be a fun one to try. This is a fun category if you like crafts or crafty types of things. Seriously, if you’re a crafty person, look at each of these companies, so you understand what they are offering. Unfortunately, the commissions aren’t impressive for any of them, except Life Expressions (84) which is slightly above average. However, I’m unsure if there is a maintenance fee. This is a nice category for those of us with kids or grandkids who we want to keep reading or playing educational games. Remember you get discounts on your products, and you usually have samples that you can use, so your kids can be reading your samples. If you have kids in your family, you’ve probably given a book or two as a gift. I’m quite familiar with Usborne Books (180), and I like the below average start-up cost, low maintenance fee, and average commissions. If we knew what the maintenance cost was for Barefoot Books (12), that could be a good option as well. SimplyFun (152) is number 1 on this list because they have no maintenance fee. If you can cover the start-up fee, this could be a good one with the holidays approaching. This category could actually be called Hair & Nail Care and Accessories. I like Lilla Rose Haire Awesome (88) at no maintenance fee and 30% commissions. It’s not super inexpensive to start though, so you would choose this company if you want the products. Color Street (26) and Jamberry (63) are both fun nail products. If you or your daughter like doing your nails, these are both fun and similar, yet different. I highly recommend trying to get samples of each. But if you’re purely looking at the business, Jamberry is less expensive to start, less expensive to maintain, and a little higher in commission. Remember, the cost to maintain is monthly unless I indicate that it is per year. 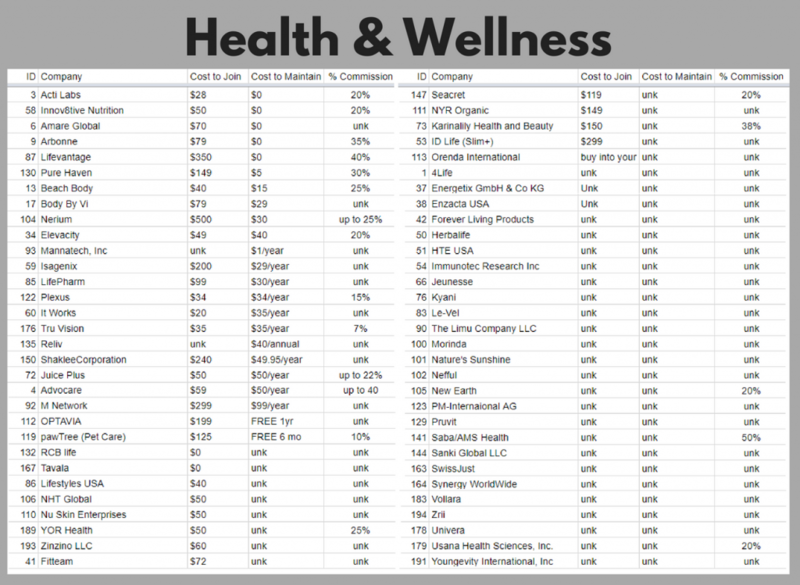 Health & Wellness is clearly the largest category of direct sales companies. For the most part, these companies are selling some sort of product that is aimed at your health and well-being, such as protein and a variety of supplements. Some of these companies encourage or even require an auto-ship order. Some will give you a bonus of 5% off if you use the auto-ship feature. But many, even though they have auto-ship, will allow you to skip, postpone, or cancel your auto-ship with no adverse effects to the consumer. But as the salesperson, this is important to note because not following through with the auto-ship will likely reduce the amount of ways that you can make money. Almost all people who sell for a health & wellness company do so because they are using the products and have had some success. It’s easier to sell something that you have used and can show good results. If you’re reading this list, looking for something you could try selling, you’re probably not going to randomly pick a company from this category. These companies are usually more expensive to start. On the other hand, if you’ve used a product from a company on this list and have had success, this would be a great list to work from. Passion for your product is very important! If you’re a home decorator type, this might be your category. Remember to look at the products because you want to love them if you’re going to try to sell them. Notice that Noonday (108) requires you to refill inventory, which means you’re buying and selling from your own stock. I’m actually going to my first Noonday party this coming week. I was excited that I had heard of it (from putting together this list) and I’m excited to see it in person. Selling from your own stock is costly in many ways. You have to purchase it ahead of time and hope that you chose the items that your clientele will want. Plus you have to store it somewhere, and you have to haul a lot of stuff if you’re taking it to a home party or vendor event. Based on the risk involved in having inventory for Noonday, I would pick Signature Home Styles (151) from this category. They have a semi-low enrollment fee and average commission. This group of companies will help you care for and clean your home. You might recognize Kirby (75) as the vacuum cleaner company. They use the direct sales model to sell their products. More familiar to me is Norwex (109). I actually have a few good friends who sell Norwex. It’s fabulous, safe cleaning products. I like that it has a low maintenance fee and above average commissions. The start-up seems a little high, but I know they have a special at least once a year where you can start for free or very little. Jewelry is another large category. Remember that I’ve sorted these first by the cost to maintain, and next by the cost to join. The reason for sorting this way is so that you can see long-term costs. In the long run, a company that charges you $10 per month to maintain will cost you $120 over the course of the year. And this is year after year. This is a business expense that you will write off on your taxes, but it’s still a long-term expense to consider. On the other hand, if you legit have no money to get started, you need to look for a company that charges you zero to start, even if there’s a monthly fee. If you have no money, you need to start somewhere. Besides, that monthly fee won’t matter if you’re making sales! It’s all just something you need to take into consideration. 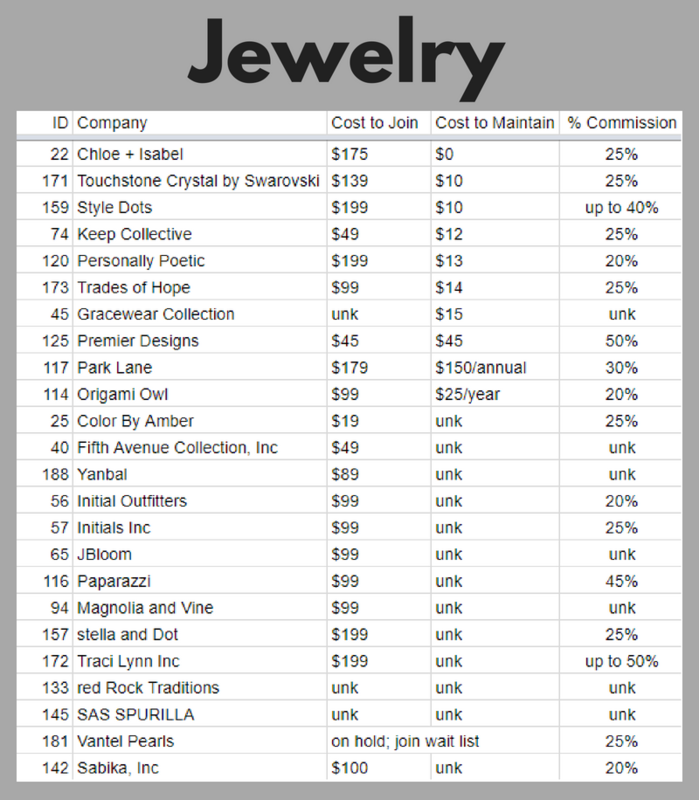 So in this category, my good friend sells Chloe + Isabel (22), and I love that it’s number 1 on the jewelry list! It’s not cheap to start, but I love that there’s no cost to maintain, and they’re paying 25% commission which is common. If you like jewelry, you’re looking on the right list! Look at each of the companies websites and see if you like the jewelry. You are your biggest advertiser, so you’ll want to wear your jewelry to show it off! Also worth mentioning, Paparazzi (116) is $99 to join, which is very common, but they pay 45% commission. But be careful – don’t let that UNK (unknown) monthly fee surprise you! Premier Designs (125) is only $45 to join and pays 50% commission. Unfortunately, that one will cost you $45 per month to maintain. However, when you consider a 50% commission, you can pay for your maintenance fee with just 1 $90 sale. If you like to entertain or cook, this might be your group. Some of these companies are food based while others are selling pans and other kitchen gadgets. But again, you really need to join a company that offers a product or service that you use and that you’re passionate about. In this category, it looks like Pampered Chef (115) is the least risky to join with a very low monthly maintenance. The companies on the miscellaneous list all sell many things and cross into many of the individual categories. Avon (11) for example, sells skincare, clothing, jewelry, toys, and more. I grouped these together because they all have such a wide offering. Some of them make me think of a “shopping” club. 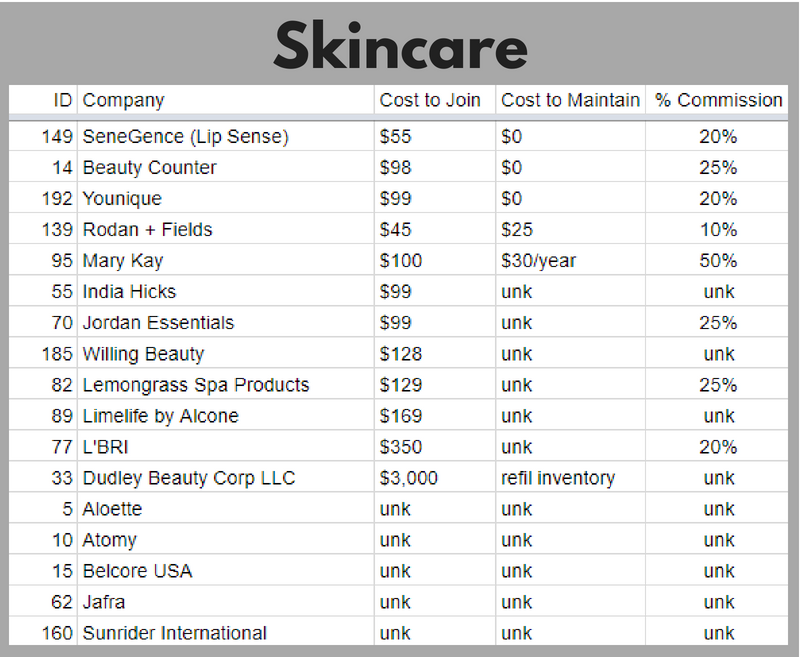 From this list, Avon is actually a good choice in that it’s a low cost to start-up and no maintenance fee. I had always heard that they paid 40% commission, but remember, I’m showing the minimum you’ll earn when first starting. I’m very fond of this group! I’m connected with Prime My Body (127) and Young Living essential oils (190). Again, look for a product that you believe in, and something you use! Now that I built this list, I see there is a hemp oil that is less to join/maintain, but I joined Prime My Body because I believe in the product and the developers behind the product. I’m also on a very strong team who is constantly talking it up on social media, so I feel good about my choice, even though it costs me $39/year to be an affiliate. I joined both Prime My Body (127) and Young Living (190) as an affiliate so that I could get a discount. A lot of people do this. When they don’t charge you a monthly fee, it makes it easy to do this, and if you buy enough of the product, it just makes sense. These companies didn’t have real categories that they fell into so here they are together. Surprise Parties (162) and Pure Romance (131) are adult themed companies. Premirica (126) is a financial company. And Damsel In Defense (30) is a personal protection company. This category could actually be called skincare and cosmetics. It’s not the largest category, but likely one of the most popular. I’ve personally used several of these products. Many of the Health & Wellness companies also carry a skincare line. So again, overlapping categories. But these companies are primarily skincare and cosmetics. Number 1 on the list is a somewhat newer company, SeneGence (149). I love that they are only $55 to start and nothing monthly to maintain. The minimum commission you earn is 20%, but this is based on placing a minimum order. You’ll either order to hold in stock, or you’ll take orders and then place your order. Your discount, and therefore your commission, is based on the amount you order. I’m sure many of you have heard of Mary Kay (95). It’s not top on this list, but it’s good to note that you are earning 50% commission if you charge the full retail price to your customers. Several years ago, the practice with Mary Kay was to push really hard for holding inventory. Now that people can order on your website, it’s easier to not hold inventory. And for only $30 per year, you can accept credit card and order processing right through your replicated website. You might consider one of these companies if you like to entertain, or you consider yourself an avid coffee, tea, or wine drinker! 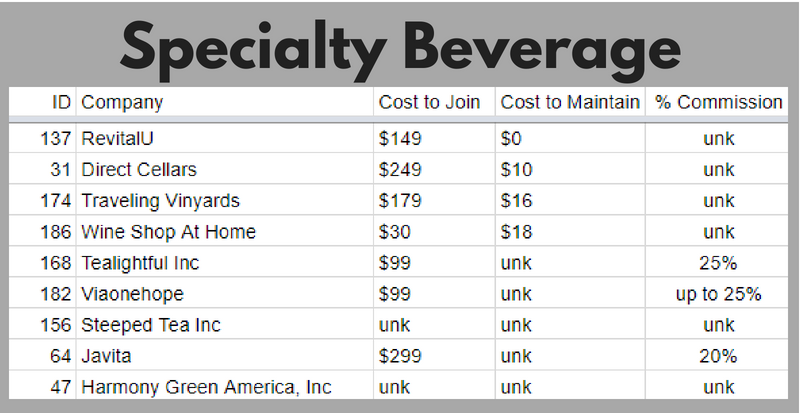 From the Specialty Beverage list, RevitalU (137) looks good with no monthly fee, but Wine Shop At Home (186) would be the least expensive to get started. RevitalU is a “diet” coffee. Very interesting! I can speak about Direct Cellars (31) because I’m in that one. It’s a wine of the month club and the $10 per month is for shipping the auto-ship, which will cost $79 if you don’t have 3 referrals from the previous month. Again, I can’t stress enough that you should reach out to whoever’s link I posted and ask them questions. This is my category! I’m a Senior Consultant for Thirty-One (170). Thirty-One has home decor as well as jewelry, but their main things is totes and purses. While they look like #1 on this list, and I obviously LOVE them, they do still have a monthly maintenance fee for their replicated website. It’s totally possible to run this business without it, but in this day and age, with internet shopping, it’s what people want. People want to be able to hop online anytime they want to place an order. Nonetheless, it’s a good example of choosing a product that you love and going with it, regardless of the maintenance fee. I average around $1000 per month in sales. At 25% commission, I am receiving around $250 per month in commissions. I get paid on the 10th and 25th. Right after the commission payout on the 10th, the company charges me $15 for the website and emails that they send out on my behalf. If I wasn’t making sales, $15 per month would be hard to swallow. If you really want to join a company that has a maintenance fee – do it! Just make an escape plan. When will you call it quits if you aren’t making any money in return? However long you choose – make sure you give yourself a chance. It does take time to get some traction, especially if you’re trying every company offered to you. Your close friends and family need a little time to see that you are serious and may have found something you really like. On the other hand, if you flat out changed your mind, contact the company and cancel so that you don’t lose any more money on monthly fees. This category might be more your style if you don’t want to sell anything, but you want to steer away from the traditional DS companies. Since virtually everyone uses energy, your market is endless. And it doesn’t feel like DS because it’s something you’re using anyway. However, you probably use household cleaners and skincare every day too, but something about this category feels different. I didn’t find a lot of info on them, so please research them closely. I wanted to make one last category to make special mention of a few unique characteristics. These companies are already listed above in their product category. But I wanted to make special note of the basis of their businesses. For example, Color By Amber (25) and Trades of Hope (173) both pay fair wages to women in other countries. That’s not to say that the other companies don’t pay fair wages, but these 2 companies use this as the foundation of their business. As it states in the image, Beach Body (13) waives some fees for military, military spouses, and veterans. Red Rock Traditions (133) and Gracewear Collection (45) have product lines that are heavily faith-based. Thirty-One (170) is named after Proverbs 31. Most of the 194 companies on this list are dedicated to empowering women to succeed. And most have a charity or organization that they donate to and support. Are Direct Sales Companies Legitimate Opportunities? I have no doubt that Direct Sales is a viable and lucrative opportunity. It’s not a job, but rather a business, and you have to be motivated to put effort into it. But the good new is, if you put in the effort, you will likely find some amount of success, whether it’s a little spending money, or fully replaces your income. If you want to look closer at any of the companies, click on the link in the list above. Many of the links are connected directly with a person who is currently selling for that company. Reach out to them, trust me, they want to help you! Also, use the FAQs above as a guide on what things to look for when you’re researching a company. I’ve given you a lot to consider, and many many companies to choose from. But hopefully, I’ve also helped you narrow down your search. Remember, think about what you enjoy and what you are passionate about!